Here are five favorite wildflowers for your garden! Your local garden center should stock all of these hardy plants. This milkweed offers nectar for hummingbirds and butterflies. Preferring moist soils, it’s great for use in rain gardens. This lovely perennial’s clusters of pink flowers bloom in June and July. Milkweed is tall (3 to 5 ft), so place at the back of your garden for a show in spring and a place for Monarchs to tend for the remainder of the year, while other plants and flowers create a screen in the front of your garden. Each beautiful scarlet flower stays in bloom for several weeks. Hummingbirds, and even swallowtail butterflies, love the nectar. Insects find it difficult to navigate the long tubular flowers, so Cardinal Flowers depend on hummingbirds for pollination. They need rich moist soil, so this flower would be good in a rain garden as well. Windflower is a hardy groundcover for moist, shady sites and boasts beautiful, pure white flowers that pollinators love. It combines well with other spring-blooming perennials and adds a fresh pop of color to shady areas of the garden. This classic garden wildflower provides nectar for butterflies. In late summer the seeds will attract finches and other birds. And aside from being beautiful, it’s easy to grow and drought tolerant once established. There are a number of different sizes that can be planted depending on your garden needs. Black-eyed Susan plants never disappoint, but during the height of flowering season deadhead regularly to extend their show..
First consider donating to a secondhand or resale shop. Find out their requirements first. While secondhand stores do good business, they typically sell less than 20 percent of consumer donations. Luckily, it is possible to recycle old clothing. If you prefer to cut out the middleman, some prominent names in textile recycling include the American Textile Recycling Service, Mac Recycling, Planet Aid, and USAgain. All of these companies offer clothing drop-off bins throughout the U.S., usually in high-traffic areas such as parking lots.. According to Secondary Materials and Recovered Textiles Association (SMART), about 45 percent of discarded clothing is reusable. Of the remaining 55 percent, most of it can be recycled: 30 percent is downcycled into industrial rags and 20 percent is processed into fiber that can be used in products like carpet or insulation. The remaining five percent is unusable because of contamination, and will end up in a landfill. Make sure all fabric is dry, to avoid mildew. Check all pockets to make sure they’re empty. Do your best to not break glass bottles, as there is no market for recycling broken glass. You can leave the label/foil on, but many recyclers will ask you to separate the metal caps. This is partly to ensure that all liquids are removed. Wine corks need to be fully removed. Don’t worry about non-liquids in the bottle, such as a lime wedge in a beer bottle or bits of cork in a wine bottle. Remove any non-containers from your glass recycling, such as Pyrex, glassware, windows and mirrors. These glass products can’t be recycled with containers. "In the past the plastics recycling industry was not able to effectively recycle bottles with caps on, so the message to remove the cap was created." American Plastic Recyclers explains on its website. But times have changed. Here's how the great melting pot at the local plant works: The bottles, cap and all, are ground into flake. A special "float/sink" process takes it from there — essentially, as 911 Metallurgist explains, "particles of lower specific gravity float on the surface of the medium, while the particles of higher specific gravity sink to the bottom." In other words, PET, the material bottles are made from, floats, while the heavy stuff in the cap — high density polyethylene (HDPE) and polypropylene (PP) — sink to the bottom. Before disposing of tires, ask an auto shop if your old tires can be retreaded or repaired. Either option prolongs the life of your tires and is cheaper than buying new tires. If you are having tires replaced at an auto shop, ask if the shop will recycle the old tires for you. Depending on where you live, the cost of new tires may include a tax that funds the disposal of your old tires, or disposal may be included in the service charge. If recycling tires yourself, you’ll need to remove the rim and wheel weights first. Luckily, the rim is made of aluminum and the weights are made of steel — both valuable metals you can recycle as scrap. Warning: You should have experience using power tools if you’re going to cut the tire off the rim yourself. Please exercise caution. Before recycling tires, consider a reuse project for them. Besides the obvious option of making a tire swing, they make great planters in your garden or compost bin. Donate your old CD, DVDs and tapes to a secondhand store or music reseller for reuse. Even if the items are scratched, it’s likely they can be repaired and resold. This obviously won’t be an option if you’re getting rid of blank or burned CDs and VHS tapes. Use them for a DIY art project. Mail your media to a company like the CD Recycling Center of America or GreenDisk. Make sure to remove any paper sleeves, as these can be recycled with other paper. CD jackets are office paper, and VHS tape sleeves are paperboard. Find a drop-off location for CDs and tapes near you using the Recycling Locator at earth911. When replacing your patio, walkway or parking area, install attractive permeable concrete pavers. The pavers are solid, but spaced correctly, water drains between them. Pavers are placed over a bed of sand or gravel, which filters water before it percolates into the soil. This conserves & filters water naturally & without the oil & pollutants that are present when run off flows through the sewer system and then into Lake Michigan. For driveways or parking lots, open-cell concrete blocks can also be used. The blocks are designed to support vehicles, but are sufficiently open to allow water to drain through them. The spaces are filled with gravel or sand. Grass or low ground cover can be planted in the open spaces, which will help reduce the heat build up. Another product that can be used for driveways is pervious concrete, (porous pavement). This is a highly porous form of concrete. It’s made from aggregate (small stones) and cement, which binds the aggregate together. However, unlike standard concrete, pervious concrete's composition creates a substantial number of open spaces in the concrete, which allows water to flow into the ground. Reduce: Fix dripping faucets. A drop per second wastes 192 gallons per month! First, try tightening all fittings a quarter to half a turn. If that does not work, the gaskets or O-rings might be worn out. To check, the faucet will need to be taken apart, so if you are not really handy, for best results, consult a plumber. ReUse: Reach for a reusable microfiber cloth which can take the place of 60 rolls of paper towels before it needs replacing — and is gentle enough to use on nearly all surfaces (even eyeglasses). Keep a few handy for absorbing spills, wiping down counters, unstreaking mirrors, and more. Recycle: Don't just toss worn-out garments such as tattered tees or jeans. Donate these to the ASPCA, which may use them for pet bedding. Give still wearables to Goodwill — clothing that doesn't sell in its stores is sold to rag traders or fabric recyclers. Run your clothes washer and dishwasher only when they are full. You can save up to 100 gallons a month! Designate one glass for your drinking water each day and refill it as needed. This will cut down on the number of glasses to wash.
Use a water-efficient showerhead. They’re inexpensive, easy to install and can save you up to 750 gallons a month. Install an aerator on your faucet. Turn off the water while you shampoo your hair to save up to 150 gallons a month. 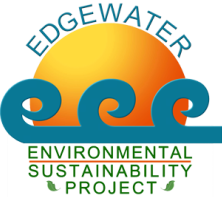 Follow Go Edgewater and join their biking and walking tours to learn about the area and its history. Take your bike or walk to the local stores, theaters and activities. Healthy exercise, less pollution and you will support your neighborhood businesses. Reduce your carbon footprint! Leaving your car at home twice a week can cut greenhouse gas emissions by 1,600 pounds per year. If you must drive, save up errands and shopping trips so you need to drive fewer times. HOW DO YOU START YOUR SPRING CLEAN UP? Always pick up glass litter when you see it. Broken glass can hurt children, pets, as well as damage bike & car tires. Help elderly neighbors clear up around their homes. They may not have the energy or ability to keep it up & will appreciate your kindness. If you see someone going out of their way to clean up around the community, thank them! Thank a business when you notice that they are cleaning around the outside of their business. Send an email to a “Special Service Area” (part of the Chambers of Commerce) letting them know that you appreciate their ongoing cleaning & beautification efforts. Air quality decreases during heat waves: The heat and sunlight essentially cook the air along with all the chemical compounds lingering within it. This chemical soup combines with the naturally occurring nitrogen oxide in the air, creating a“smog” of ground-level ozone gas. This makes breathing difficult for those who already have respiratory ailments or heart problems and can also make healthy people more susceptible to respiratory infections. Door Draft Stoppers Cold, drafty air often sneaks in underneath doors. You can purchase simple door draft stoppers to cover up these cracks. You can even roll up a rug to improvise. Window Insulator Kits As houses settle, cracks tend to form around windows. If there are drafts sneaking in through your windows, it could cost a lot more to heat your home. You can buy a window insulator kit to cover your windows in a thin plastic film in the winter months to keep the chill out. Set Your Water Heater at 120 The Environmental Protection Agency estimates that by setting your water heater at 120, you can lower your water heating expenses by 6-10%. You can further improve your water heater’s efficiency by insulating it. Add Extra Blankets to Your Bed Instead of turning up the heat at night, add an extra blanket or down comforter to your bed to keep toasty warm. Then you can turn the heat on in the morning to take the chill out of the air. Replace Your Light Bulbs Get rid of your old incandescent bulbs and replace them with modern LEDs. They use less energy than incandescent, last longer and are safer than CFLs. Since you didn't cut down your final autumn flowers you know that the dried flower heads of aster, black-eyed Susans, coneflowers, sunflowers and other plants are seed havens. These wildflowers’ stalks also may house insects for birds that need a little protein. Make sure to leave berries and other fruit on your native trees and bushes. Finally, if you left your fallen leaves on the ground since autumn, the decaying leaf litter will provide a feast of insects, seeds, nuts and other treats for your backyard birds. 1) Give your trees a drink. Winter droughts require watering as much as summer droughts. If temperatures permit, an occasional watering during the winter on young trees can be a life saver. Water only when soil & trees are cool but not frozen. 3) Homeowners should prune their trees. Winter is actually one of the best times to prune because it is easier to see the structure of trees without their leaves. Limit pruning to deadwood & poorly placed or crossed branches to save as many living branches as possible. 4) Prevent injuries. Branch breakage or splitting can be caused by ice & snow accumulation, or chewing and rubbing by animals. Clear & clean the problem as soon as possible. Prevent problems from occurring on young trees by wrapping the base of trees in a hard, plastic guard or a metal hardware cloth. Wrapping trees with burlap or plastic cloth also can prevent temperature damage. Remove the guards in the spring to prevent damage when the tree begins to grow. Some car fluids like motor oil can be processed and recycled into new fluids. Every gallon of used motor oil that is improperly discarded can contaminate 1 million gallons of drinking water, according to the EPA. Motor oil also never wears out, but rather gets dirty, so it is often recycled and resold. Old motor oil can be refined, reconditioned or reprocessed to become usable again. An oil filter is made of three basic items: paper, steel and plastic. All of these items are recyclable when sent to the proper recycling outlet. Many Auto Zone and OReilly Auto Part Stores accept used motor oil. There are stores within a five mile radius of Edgewater but call ahead on their requirements for the oil and if they will accept the used filters. When your oil is changed by professionals, they are required to follow strict disposal procedures as well. Install tight-fitting, insulating drapes or shades on windows that feel drafty after weatherizing.. Schedule a regular check of your tires - both the tire pressure and tread depth. Use a gauge to check that the tire pressure agrees with the label on the door, not the maximum pressure shown on the tires' sidewalls. Uneven wear indicates a need for wheel alignment. Check the tires for bulges and bald spots. Look carefully to see if the wear bars are showing at right angles to the treads. Evenly spaced around the tires, wear bars appear when tread depth is less than 2/32 inch. An easy check is to insert a nickel between the treads. If the head on the nickel is fully visible, it is time to replace the tire. These actions will protect you and your family, reduce the amount of gas used and less gas equals fewer emissions and cleaner air. When you calculate gas, wear and tear and other car expenses, driving alone to and from work costs you about 56 cents a mile. That can add up to thousands of dollars a year. Not to mention the stress on you. Join the thousands of commuters who make every mile count by avoiding driving alone or even driving every day. Choose to do one of the following. Carpooling: Share the ride -- it saves money and reduces stress. Check with fellow employees via posts or newsletters. Telework: Avoid traffic altogether by working from home. And it helps improve productivity! Ask your boss if this option is available. Compressed Work Weeks or FlexTime: If you can't change how you get to work, change when you work. Public Transportation This may be the best option, depending on your destination and access to CTA or METRA. Tip: Planting Trees provides shade, releases oxygen, traps CO2 & pollutants. A win win. a) More action includes celebrating Arbor Day each April with Local Schools by planting a tree. b) Notify the Bureau of Forestry when a parkway tree has 25% loss. Keep the confirmation number.Ask for the type of tree you wish planted. Keep it watered using the slow drip method. Air quality decreases during times of hot temperatures because the heat and sunlight essentially cook the air along with all the chemical compounds lingering within it. This chemical soup combines with the naturally occurring nitrogen oxide in the air, creating a “smog” of ground-level ozone gas.This makes breathing difficult for those who already have respiratory ailments or heart problems and can also make healthy people more susceptible to respiratory infections.